Making a strong case for your local marketing and promotion budget is important to every member of New Mexico’s tourism industry. While revenue streams and funding sources are shrinking around the state, tourism is a bright spot that can diversify New Mexico’s economy. The New Mexico Travel Promotion Toolkit was designed to provide industry partners the resources necessary to lobby for increased funding for marketing and advertising in their own local budgets. Investing in marketing will yield a positive return by generating new tax revenue to fund public safety and important infrastructure projects. These talking points include impact statements and statewide statistics on jobs, taxes, return on investment, growth, economic impact, and visitor spending. You can use these tools to illustrate the importance of the tourism industry as a whole for New Mexico. Sample correspondence to local elected officials and key stakeholders is included in the toolkit. Using the template provided, you can fill in the most pertinent and impactful local data points from your community to illuminate the importance of tourism to your own local community. Earlier this year, the U.S. Travel Association highlighted New Mexico’s promotional successes in a case study published in January, 2017. This case study emphasized the impact of New Mexico True on not only the tourism industry, but on statewide economic development as a whole. This article can be used to showcase the many positive impacts that New Mexico True has had on the state as a whole. Having access to high-quality, impactful data at the local level is essential for promoting and advocating for tourism within communities. Local data is broken down by region and county, and provides statistics on jobs (including percent of jobs supported by tourism), taxes (local, state and federal), economic impact, spending, growth, and tourism dependence. 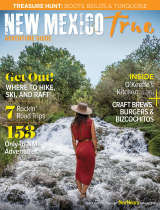 Third party research has emphasized the importance of visitation and exposure to New Mexico True marketing on not just the New Mexico tourism industry, but on economic development. The graphic included in the toolkit shows just how huge that impact can be. This graphic shows that boosting exposure and visitation to New Mexico vastly improves perceptions of the state as a place to live, work, and start a business.